Meticulously crafted from the principles laid out in Matt Fitzgerald and David Warden's best-selling book 80/20 Triathlon, this Sprint Level 0 training plan will prepare the athlete to complete their first triathlon. Each week, cycle, and the complete 12-week plan has been specifically formulated to match the research articulated in Fitzgerald's publications and ensures the triathlete adheres to the 80/20 principle. 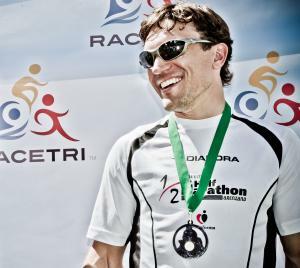 This plan is intended for individuals with a goal of finishing their first sprint event. Before you begin, you should be comfortably able to swim and run for 30 minutes, cycle for 45 minutes, and successfully complete at least three total hours of aerobic exercise over seven days. The weekly training volume starts at approximately four hours in Week 1 and peaks at approximately 6.5 hours in Week 8. This plan leverages the TrainingPeaks.com structured workout feature with power-based run and HR-based bike workouts. All swim workouts are pace-based. On supported devices, including many Garmin models, each workout can be exported to the device, which will automatically guide you through the session with duration, lap, and intensity prompts. Workouts do not have to be exported to be performed effectively, as the detailed descriptions provide all the information you need to successfully complete the workout. See our Structured Workout page for more information.